No need to shy away from a brilliant, white kitchen—these pointers will keep your space sparkling clean. 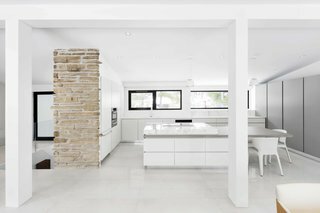 There’s something about a predominantly white kitchen that sets our hearts aflutter: its bright, crisp aesthetic can make a home feel more expansive and bring a sense of calm. 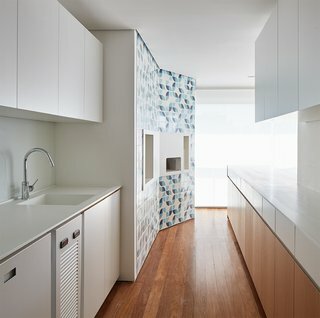 Many homeowners, however, tend to be a little skittish about white kitchens, as they have a reputation for being difficult to maintain and keep clean. This isn’t necessarily the case—at least not with the following seven tips. Don’t let a little grease and grime deter you from installing the white cabinetry, counters, sinks, and appliances of your dreams. 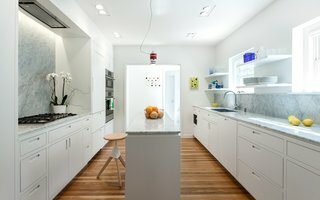 Read on to find out how to keep your white kitchen at its most brilliant. Direct sunlight can cause white cabinets or laminated surfaces to turn yellow. To prevent this, install curtains or blinds, or tinted glass windows, to protect your cabinetry and worktops from strong sunlight. 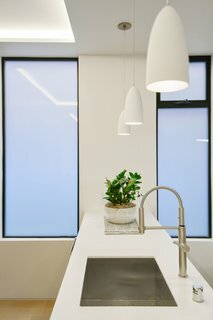 Tinted glass windows protect this white kitchen's luminous sheen. Grease particles from cooking are the biggest cause of staining in kitchens over time. To stop grease from accumulating on your cabinets and counters, switch on the exhaust fan or range hood as soon as you begin cooking. 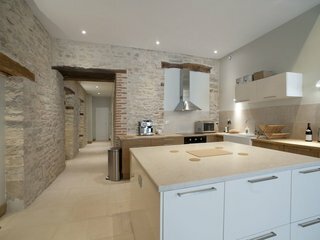 An apartment in the heart of the historical center of Beaune boasts a white kitchen. To keep your white cupboards looking bright and fresh, create a cleaning solution with one cup of vinegar, one tablespoon of baking soda, and two cups of warm water. Dip a rag in this solution, wring out the access liquid, then wipe down your cupboards. Do this at least once a month. A cleansing solution of vinegar, baking soda, and water prevents staining in white kitchens. White sinks can look grimy pretty quickly, and the best way to prevent signs of wear is through household bleach. To prevent it from running straight down the drain, line the bottom of your sink with paper towels, then wet them with bleach. Leave the bleach-soaked towels for about half an hour, then remove them, and rinse the sink with warm water. If you’d rather not use bleach for sink stains, one natural alternative is to fill your sink with club soda and lemon juice, let the solution soak, then rise with warm water. A bleach bath lifts stains from white sinks. 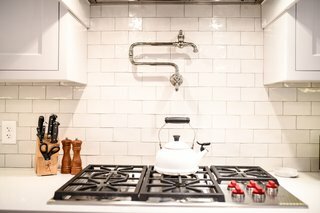 If your kitchen has a white tile backsplash, any dirt that accumulates on the grout will seem more obvious, so be sure to take care of this regularly. Create a paste with baking soda and water, and apply it to the grout. Put some vinegar into a spray bottle, and spritz a coat of vinegar onto the paste, then scrub the grout with a toothbrush and rinse off the mixture. Keep your white backsplash, such as Porcelain and More finish, free of grimy grout lines. To get rid of stains on white laminate counters, mix household cleaning detergent with baking soda—one part detergent to three parts baking soda usually does the trick—and apply this solution directly onto stains, then scrub everything down with a nylon brush. Wipe the countertop with a damp cloth, then dry the surfaces quickly, as laminates are sensitive to excessive moisture. Neutral colors and streamlined appliances like the Miele oven, stovetop, and refrigerator, along with the Espace Cuisine cabinets, create an elevated interior. Natural stone surfaces like marble or granite are porous, meaning they absorb liquid much more quickly than stone composite or laminate surfaces, so clean any spillage immediately so that it doesn't seep into your counters. If a stain does develop, one way you can get rid of it is with a solution of hydrogen peroxide with a smidge of ammonia. 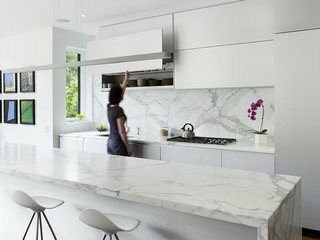 Onda barstools by Stua from Design Within Reach surround a 13-foot Calacatta marble island. 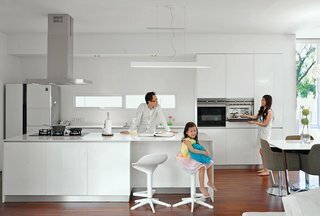 Custom white aluminum cabinets float above the kitchen appliances by Miele with a stovetop from Wolf and a range hood by Airmec Bello. Want more kitchen inspiration? See 30 White Kitchens That Are Anything But Ordinary.